This colorful image may look like a miniature set of model cars, foam buildings and painted grass, but it's nothing of the sort. 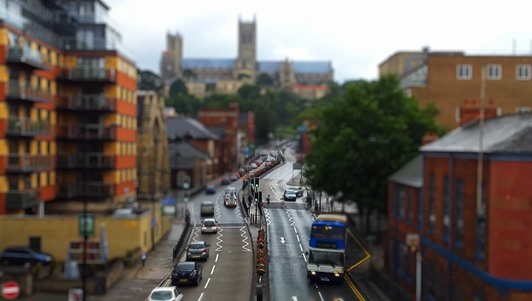 It's a still photo from a time-lapse video that Stu Kennedy shot in his hometown of Lincoln, England. But it's not your ordinary time-lapse. Kennedy used his trusty new Samsung Galaxy S2 and its 8-megapixel camera to capture the video in high-definition (1080p). And that's not all. He also used a post-editing technique called tilt-shift, which transforms the normal footage into a miniature toy illusion. Check out the video. Normally, photographers wishing to get the above look would resort to digital SLRs with special, expensive lenses. Canon sells two types of tilt-shift lenses for its DSLRs, but the prices range from $2,000 to $2,400, making it difficult for anyone but professionals to enjoy the fine art of tilt-shift photography (unless you want to make your own DIY tilt-shift lens). Watch the following video for an example of what you can do with a tilt-shift lens, and then check out the Lights! Camera! Photoshop! World to see some example images. 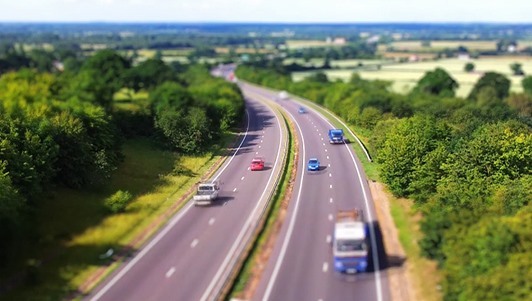 Time-lapse video taken with the Canon EOS 5D Mark II using a tilt-shift lens. But Kennedy has just taught us all that you don't need expensive lenses—even expensive cameras—to take awesome tilt-shift video. All you need is a smartphone capable of filming in HD, particularly something like Samsung's Galaxy S II, which is currently available in places like the U.K., but is not likely to reach U.S. soil until this fall—possibly August. Kennedy said in a comment on Fstoppers that he was "overwhelmed with the capability of the Galaxy S2" and wanted to do "something cool" with it. He obviously did. First, Kennedy had to capture the time-lapse footage with his cell phone camera. To do this, he mounted his Android device on a tripod using an old junk phone case, for which he glued to a 90-degree bracket. After capturing the HD footage with the video recording feature at 30fps, he then used some compositing and editing software to produce the "miniaturized" look, specifically After Effects and Sony Vegas. To turn the footage into time-lapse, Kennedy used the timeline feature in After Effects to reduce each clip to 27 percent of its original time. That's not exactly how you do real time-lapse, but it works to get that sped-up effect. Then, he created the over-saturated look by adjusting the hue and saturation, and added a camera blur effect. When it came time to uploading to the web, he reduced the 1080p product to 720p for Vimeo in Vegas. The end product is breathtaking, thanks in part to the simple piano-filled, emotive soundtrack joining the video. The mini-moving people look like animated toy figurines, and the train footage feels like something that should be in Mister Rogers' Neighborhood. 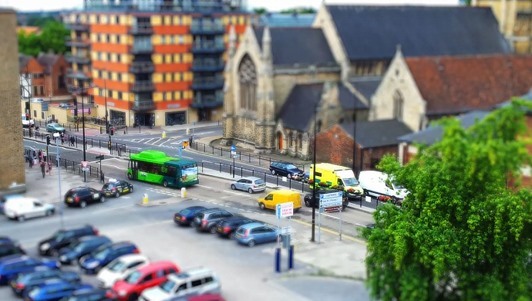 But if you think this is the first tilt-shift video you've seen, you're probably wrong. 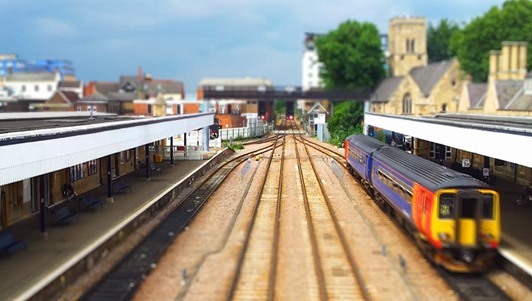 The most recent example of this tilt-shift trick was used in David Fincher's movie The Social Network during the Henley Royal Regatta Race. Check out Kennedy's website Kake Pipe for more of his work. Also, check out the video below for a brief tutorial on applying the tilt-shift effect in After Effects (though Kennedy states that the "color correction was way off" in it). And if you don't have After Effects, below are a couple of tutorials for other programs that let you create a tilt-shift focus effect, like Final Cut Pro and Photoshop.